So today my mum and I went into London to have a bit of a girly shopping trip down Oxford Street before we go back to work next week… boo! 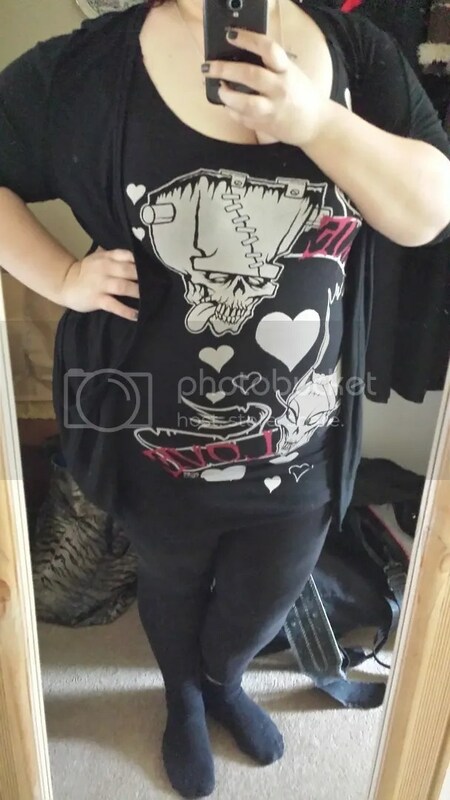 I wore my new dress from Kreepsville 666 and the fit wasn’t as bad as I feared it would be! It’s noticeably bigger than my other Kreepsville 666 dress but it was very comfy and I really liked it. 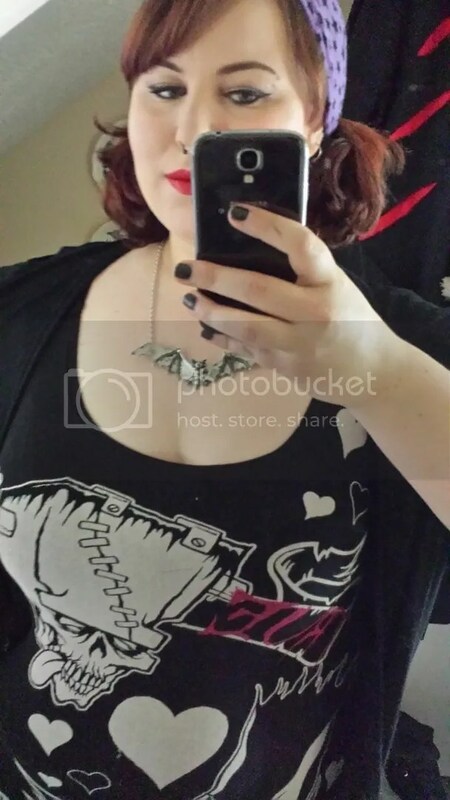 I also wore one of my favourite necklaces, my big pewter bat from Alchemy Gothic, and my purple and black star bandana. I felt really good about what I was wearing today and, actually, the lady at the Illamasqua counter in Selfridges complimented me on my ‘look’- win! I have to apologise for the state of the photos of my makeup- I totally forgot to take any before I left so you’ll have to make do with ones I quickly took in the Debenhams toilets! I wore my Estee Lauder Double Wear foundation- rather maddeningly I actually think that it’s too dark. I had some major tide lines today and it’s either the foundation or my Urban Decay Naked Skin Loose powder, and I’m pretty sure it’s the foundation… eek! 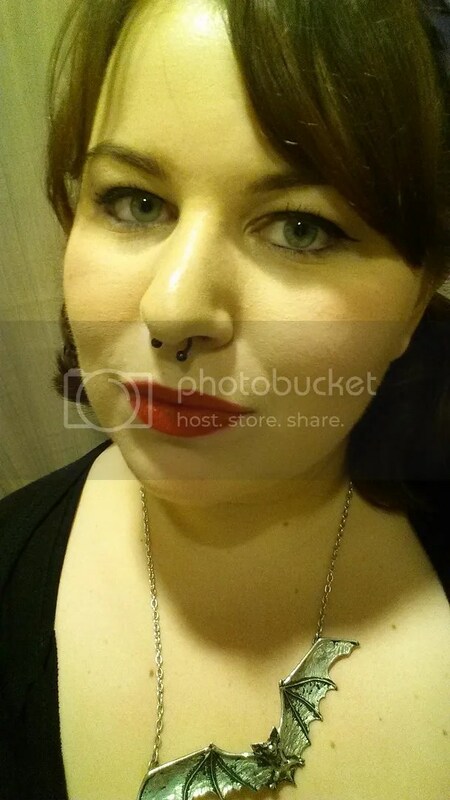 I also used my new Urban Decay Naked Skin concealer, MUA Brow Define, my Naked 2 palette, Benefit Bella Bamba blush, Collection Bronze Glow Matte bronzer in Terracotta to contour, my Eyeko skinny liner, Lancome Hypnose Drama mascara and finally one of my favourite lipsticks- Illamasqua Sangers. It’s BEAUTIFUL, you guys! Well… that’s what I was wearing. On to the trip! I’m going to be honest: it was a little bit anticlimactic. We started off at the Simply Be flagship store and had a right proper rummage through everything. There were a few bits and pieces that I liked- I especially liked seeing the small selection of Voodoo Vixen pieces they had!- but there wasn’t anything that jumped out at me (or my mum, for that matter). 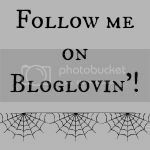 There were a few things that I might go back and check out a bit closer to the summer when I’ve possibly lost a bit more weight, but on the whole- I wasn’t enamored. We didn’t even try anything on! We then wandered down the road a little bit to Accessorize, where my mum bought a pair of earrings, and tried to kill a bit time until lunch, ha! Neither of us had eaten breakfast so by the time midday rolled around we were starving. We went to Yo! Sushi down Poland Street and had a little bit of a mini-feast. My mum doesn’t actually like sushi, but loves Yo! Sushi- mainly for their chicken katsu- so she was happy trying a few of the non-raw bits I had (like prawn katsu rolls and she ordered a special portion of prawn nigiri for herself!) alongside a bowl of chicken katsu curry and a few dumplings. I had a good time trying lots of new things, such as their yasai roll- delicious!- and their new Albacore tuna and truffle nigiri- surprisingly peppery, but still nice- and also a portion of takoyaki (octopus balls) that were delicious and melt-in-the-mouth and possibly my new favourite thing. They had the glass slipper on display, you guys! 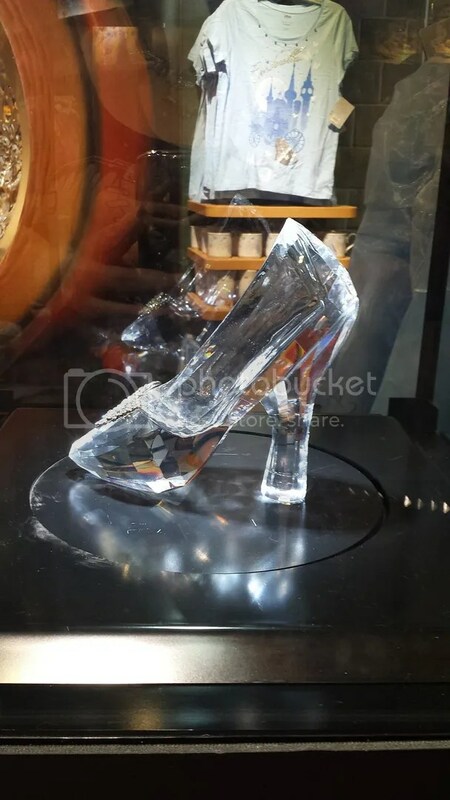 Okay, so it probably wasn’t the glass slipper from the movie- it looked a little too big for that!- but I still got overly excited and had to take pictures. They also had a little mock up of Cinderella’s kitchen, and a replica carriage which was golden on one side and pumpkin on the other. I wanted to take a photo in it but a man was just sitting in it for the longest time, and then a bunch of girls were being silly, so I left it. Grr. 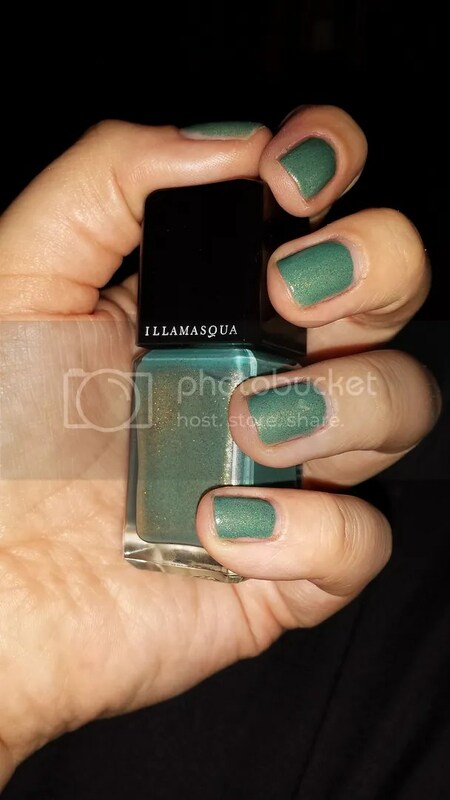 So, I only purchased from Illamasqua! There was lots I wanted to get at MAC but I decided to wait until payday, because the stuff I wanted from there (blusher, lipstick, powder) was less ‘crucial’ than the things I wanted from Illamasqua. I did however get an absolute plethora (well, three…) of foundation samples from a very patient girl at the counter. The MAC foundations are in the three bigger pots- I swatched some on my jawline/neck before I asked for the samples, to make sure I was getting the right shades- and I got a sample of Pro Longwear Foundation in NC15 (the lightest, I think, in that range but I might actually need NW??) and then Studio Fix in NW10 and NC15, because I’m going to give it another go. 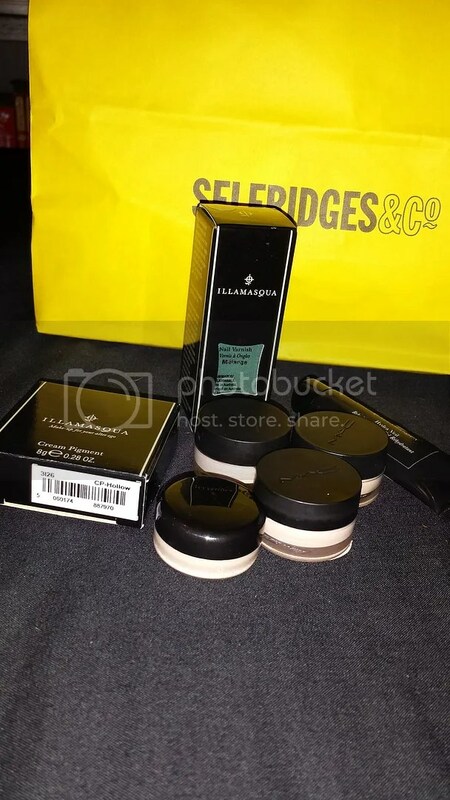 From Illamasqua, I got a sample of their Skin Base Foundation in Shade 3 (and the absolute babe that served me gave me an ABSOLUTELY FULL TO BURSTING pot of the stuff, plus a sample of Hydra Veil!) 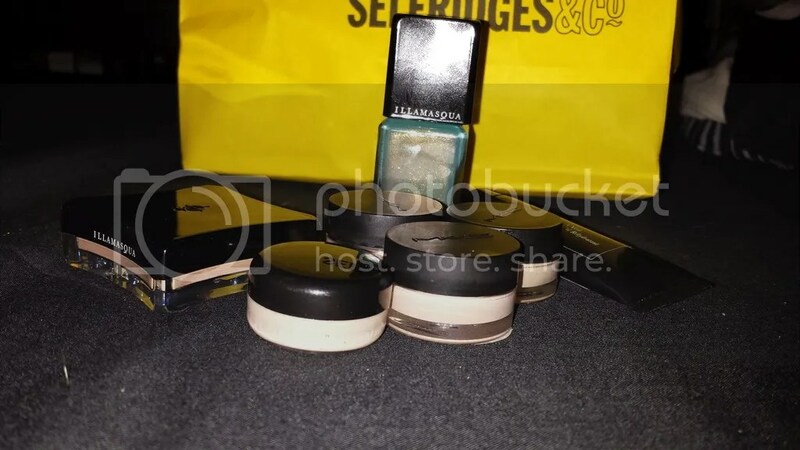 and then I bought the Cream Pigment in Hollow, and the Nail Varnish… in Melange. I got Melange guys! I just couldn’t resist. I was trying to be sensible with my choices, but I saw Melange glittering in the bottle, and then the girl showed it to me on one of her nails… and I just had to. I just had to. I put it on almost the minute I got home and… I think it might be my new favourite nail polish. It’s just beautiful! 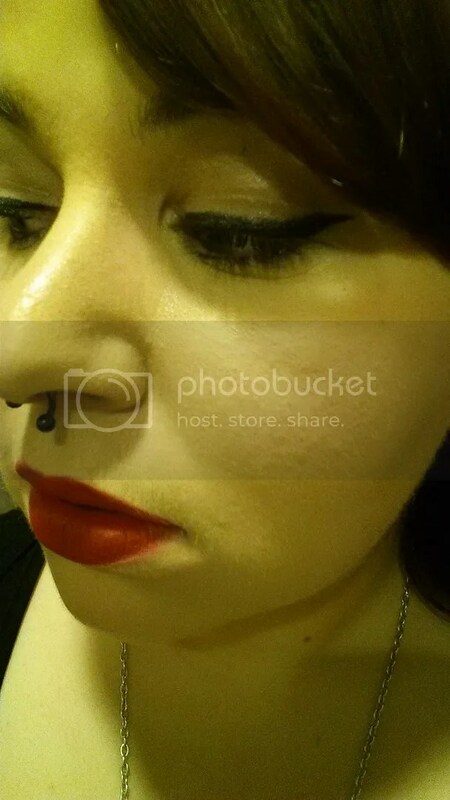 This entry was posted in Beauty, Daily Look, Makeup, Makeup and tagged Cream Pigment, glam, goth, haul, Illamasqua, Kreepsville 666, MAC, MAC Cosmetics, Melange, Nail Varnish, Selfridge's. Bookmark the permalink.